Why hasn't Obama been energizing young voters while in office? WASHINGTON--Will the young and hopeful abandon the political playing field to older voters who are angry? That is the quiet crisis confronting President Obama and the Democrats. Left unattended, it could become a formidable obstacle for them in next year's midterm elections. Moreover, the sour mood that has gripped the nation's politics could only further turn off the young. This means that the decision of Republican congressional leaders to put up a solid front of opposition to Obama could be highly functional for a party that would rather see younger, more progressive voters ignore Election Day. Celinda Lake, a Democratic pollster, offered a straightforward formula: "When Republican voters and older voters get angry, they vote," she said. "When younger voters get angry, they stay home." Thomas Bates, vice president for civic engagement at Rock the Vote, a group that mobilizes young Americans to go to the polls, shares Lake's worries. 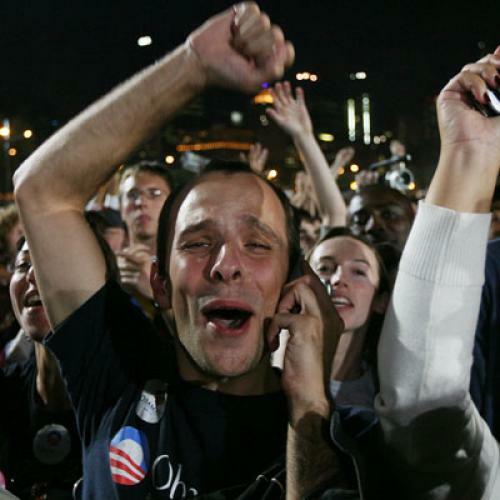 "For people who were energized in 2008, it was a time of hope and optimism," he said. "And when you get to the brass tacks of governing, the atmosphere in the process of legislating has become poisonous. That makes political engagement as unappealing as possible." More than is often appreciated, the electoral revolution that brought Democrats to power was fueled by a younger generation with a distinctive philosophical outlook. Put starkly: If only Americans 45 and over had cast ballots in 2008, Barack Obama would not be president. Obama took 66 percent of the vote among voters under 30, according to the exit polls, and beat John McCain 52 percent to 46 percent among voters aged 30 to 44. But voters 45 to 64 split narrowly (50-49 for Obama), and voters over 65 went to McCain, by 53 percent to 45 percent, giving McCain a net advantage in the over-45 set. Voters under 30 were the only age group in which self-identified liberals outnumbered conservatives. And lost in the usual grumbling about how young people don't vote, voters under 30 accounted for a slightly larger share of the 2008 electorate than did voters over 65. In 2008, the torch really was passed to a new generation. But will the young hand the torch back in 2010? That prospect petrifies Democrats already worried about lower participation by the young in this year's governor's races in Virginia and New Jersey. Lake has been scouring municipal election results this year and does not like what she sees: "a dramatically lower level of turnout from Obama surge voters," a reference to the new participants inspired by Obama last year. She called back some of the young electoral dropouts in her own studies to see why they were pulling away from politics. She cites the answers from three of them as revealing: "One of them said, 'I'm tired of politics, I need a rest.' A second said, 'When is Obama up again?' The third said, 'I don't like what any of them are doing in Washington, opposing Obama's agenda.'" Lake is worried that Obama and his team have shied away from giving their supporters an "interpretation" of the fight in Washington, and sees their outreach to the under-30s as, at best, only "intermittent." The battles in Washington could mobilize rather than turn off Obama backers, she said, if they understood that the president was resisting forces trying to block the changes he promised in the campaign. "If you are getting things done, then the discord doesn't matter," she said. Linda DiVall, a Republican pollster, also sees the malaise among the young as "a factor that's inhibiting Democrats right now," and said that soaring unemployment, which has had a particularly damaging impact on the young, could weaken their loyalty to Obama "if they believe he hasn't done anything to change the job situation." But for Rock the Vote's Bates, the biggest problem could come if Democrats give up on trying to turn out the young until the next presidential election. "It's like a party for which you send an invitation to people, those people show up -- and then you get mad at the people who don't show up, even though you didn't send them an invitation," he said. Fred Yang, another Democratic pollster, said his party has to realize that it will not win "just by getting our usual suspects out to vote, we have to expand the pool." The old politics of ignoring the young is simply not an option.